This historic hotel has welcomed royalty in grand style. The Fairmont Empress captures the spirit and energy of Vancouver Island and the beauty of this seaside city. 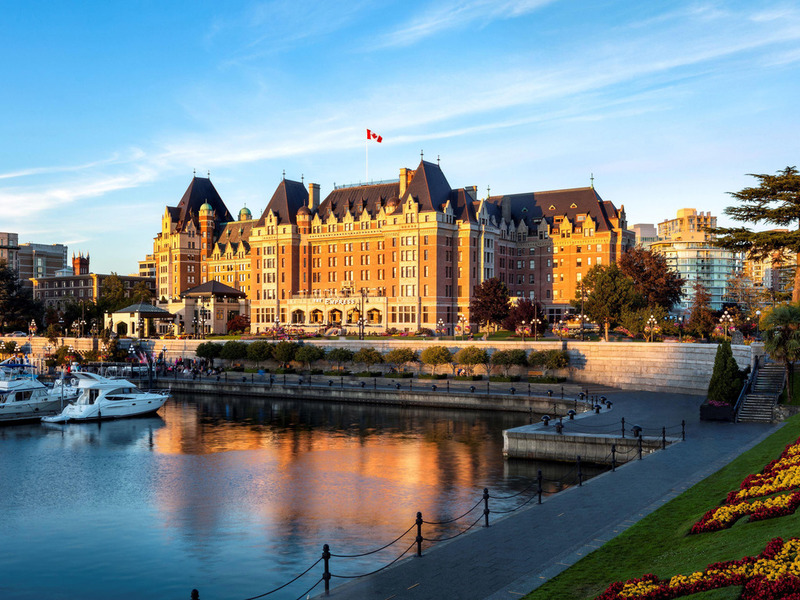 Regarded as a Condé Nast Readers' Choice and Gold List hotel, and honoured with the Travel + Leisure distinction as a top Canadian hotel, the Fairmont Empress is an iconic presence in Victoria's sparkling harbour. The hotel features 464 beautifully restored guest rooms and suites, with magnificent views. A sophisticated Lobby Lounge featuring the famous Tea at The Empress experience, a full service spa experience at Willow Stream Spa and Q at The Empress- a bold new restaurant and bar with views of the harbor. The Fairmont Empress in Victoria- BC features 464 luxuriously appointed guest rooms and suites, with magnificent views of the city, courtyard or spectacular Inner Harbor. With a selection of unique guest room sizes and categories to suit every taste, this landmark Fairmont property is a tribute to classic elegance in accommodation. Q at the Empress, located in the most storied room in Victoria, is a must-visit culinary experience. The cuisine is based on regional ingredients, partnerships with local farmers and artisans, and utilizes our own chef's herb and vegetable garden. The Lobby Lounge is the toast of Victoria. Elegant, in every sense of the word, this timeless lounge is home to the world-renowned tradition of Tea at the Empress and sophisticated evening cocktail service. Q Bar is an evocative, reinvented social hub in very good taste, but more than a little mischievous, featuring a vibrant selection of signature cocktails, extensive wine list and enticing local craft beers on tap. Reinvigorated in our timeless, sophisticated Lobby Lounge, Tea at the Empress will continue this quintessentially Victoria experience. Tea at the Empress is an absolute must-do event in Victoria. Served 11:00-18:00 in summer & 11:00-15:30 in winter.